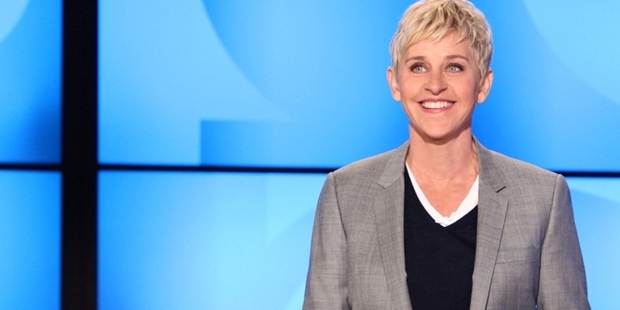 Ellen ‘Lee’ DeGeneres was born on January 26, 1958 at Metairie, Louisiana. She was described as a hyperactive kid by her parents and friends, who was always laughing and bubbling with energy. During her teens she worked as a waitress, painter, and bartender to earn some money and spend her free time more effectively. She was able to talk in a very quirky and funny manner which prompted her to enter the stand-up comedy field. She started off by performing her short comedy acts at nearby clubs and restaurants. In 1981, she was given a chance to become the emcee at the popular Clyde’s Comedy Club situated in Orleans. 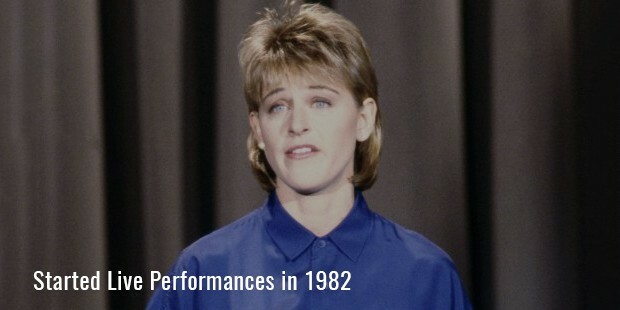 She soon progressed to tour the country with her live performances in 1982. That year she was named as Showtime’s ‘Funniest Person in America’. This was a huge honor for her as she was able to surpass many veteran male contenders to become one of the few women to have ever have won this title. She soon got many roles in films and television. In 1989, she was cast in the TV show ‘Open House’. Next she was part of the sitcom ‘Laurie Hill’ and ‘These Friends of Mine’ in which her performances were highly appreciated. Her comedy was also seen in films like ‘Coneheads’(1993), Mr. Wrong’(1996), ‘The Love Letter’(1999) and ‘Finding Nemo’(2003). She had become the star attraction of all the movies and television serials she was part of. 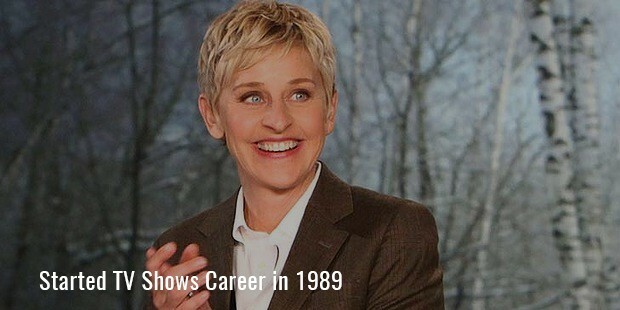 So a special show was made for her called ‘Ellen’ which ran from on the ABC network from1994-1998. The show experienced huge fan following and was at its peak popularity in 1997. 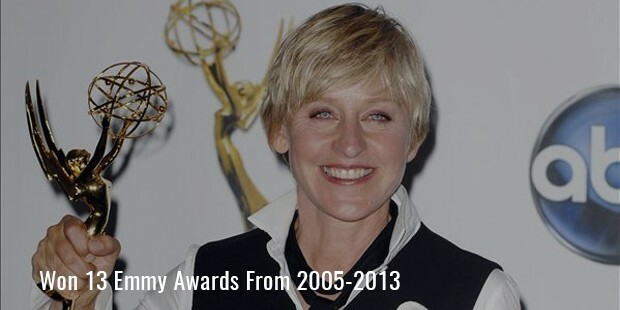 That year DeGeneres received an Emmy Award for Outstanding Writing in a Comedy Series. She made her comeback on television in 2001 with the CBS sitcom ‘The Ellen Show’. But it was the ‘The Ellen DeGeneres Show’ which was launched in September 2003 that would give her the biggest success of her career. This show was a day-time talk show where she interviewed celebrities and also had pranks and comedy throughout. In the first season itself, the show went on to receive 11 Emmy Award Nominations. It won the award for ‘Outstanding Talk Show’ and 3 other awards. 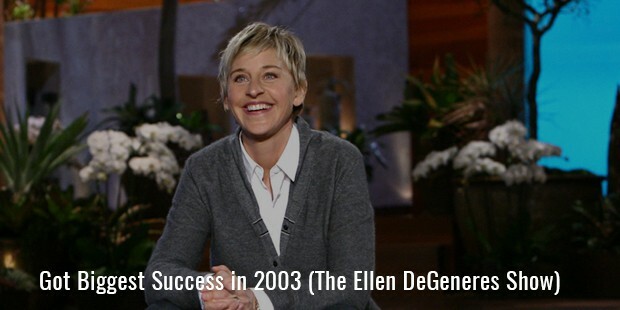 This was only the beginning of the success that DeGeneres was going to experience. Her show went on to win more than 20 Emmy awards in the first 3 seasons itself. 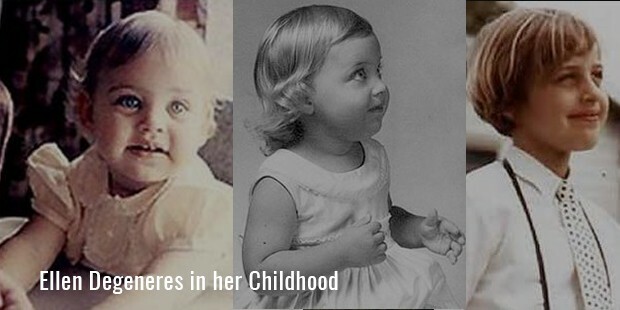 She had become one of the most popular talk show host and celebrity in the world, in a very short time itself. She has hosted the 2005 Emmy Awards, the 1996, 1997 Grammy Awards and the 2007 Academy Awards. Her talk show ‘The Ellen DeGeneres Show’ has become one of the most watched shows in the U.S. and various countries in the world and has completed its 10 year anniversary in 2013. She has won the Emmy award for Outstanding Talk Show from 2004-2007 and Outstanding Talk Show Host from 2005-2008. In total she has won 13 Emmy Awards and has won the People’s Choice Award for Favorite Talk Show Host, 8 times consecutively from 2005-2013. Today she earns nearly $50 million every year and has a net worth in excess of $160 million. She is one of the most successful female entertainers in the history of television.